This happens for every single project that I have tried: If I use terminal and say bundle install or rake db:migrate , it works fine, can see my website , works completely fine. But If I open project in RubyMine and want to do the same tasks it gives me all sorts or errors. I just copy paster some of them as an example. Note: There is a "edit configuration" that is always set on Rails 1.8 and although I change it to Rails 1.9 , still makes no difference. I am running the latest version of RubyMine on Mac. 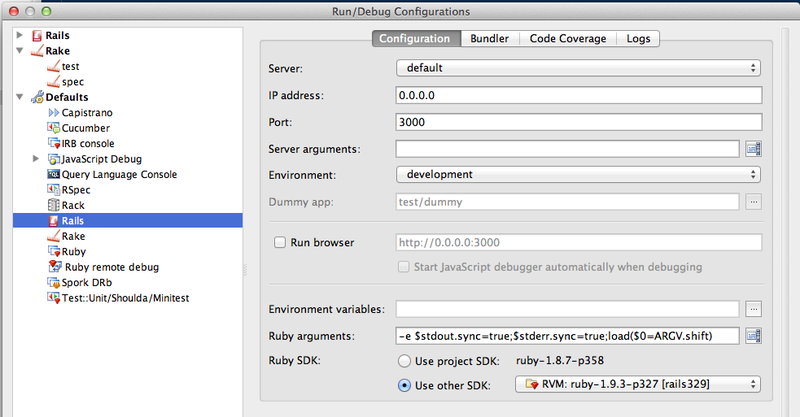 Are you sure that you have correct SDK selected in Preferences | Ruby SDK and Gems? so looks like rails 1.8.7 ?